This historical, tightly-knit neighbourhood is home to many elegant houses and businesses. 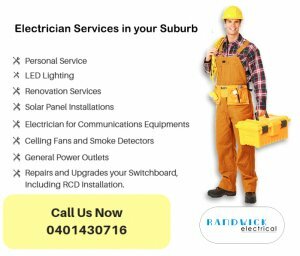 Randwick Electrical is proud to be an electrician near Queens Park. Call us the next time you face an electrical problem. Chances are, we’ll become your go-to electrical service. For optimum smoke detection, smoke alarms should be installed in every room, living area and hallway of your residence or business in Queens Park. This is very important where occupants sleep or work with a closed door. Smoke alarms cannot detect smoke through a closed door. Research shows that people are more likely to react to an alarm that is located within their room of occupancy. In multi-level buildings, we recommend additional smoke alarms be installed in the path of travel between each level. With Randwick on your side, it's easy to bring your building up-to-code. Electrical installations include cabling and associated devices such as switches, distribution boards, sockets and light fittings in a structure. Wiring is subject to safety standards for design and installation. If you live or work in a historic building, let Randwick Electrical bring your wiring up-to-date. Make us your first choice when you need a Queens Park electrician.